Borderlands is still on the brain. Freshly patched too! Nick "bapenguin" Puleo - "Borderlands and then some Borderlands. Also Left 4 Dead 2 Demo and Unwrapping Uncharted 2 for double the cash!. " Marc "DjinniMan" Allie - "We're having a party tonight, so the crowd pleasing Rock Band and Guitar Hero titles will get some heavy play. I suspect the older guys will join me on the MAME cabinet. When it's just us, Spyborgs will be the game of choice." Katrina "ShadokatRegn" Pawlowski - "I've finally gotten around to booting up some Halo 3: ODST campaign, so I'll be working on that a bit. 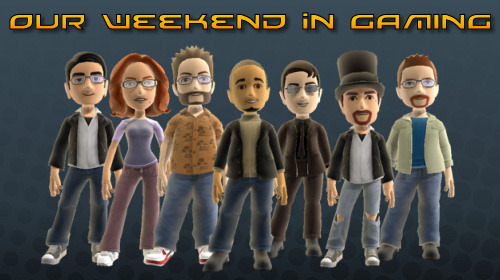 There's also Borderlands and South Park: GO Tower Defense to co-op with on this nice snowy indoor weekend." Mike "pheriannath" Katsufrakis - "I will be playing as much Borderlands as humanly possible as long as my co-op partners are around! Barring that, I'll be playing some Half-Minute Hero on PSP and Brutal Legend." Jim "txshurricane" McLaughlin - "I need to get some more time on Operation Flashpoint 2 if possible, and I have a sudden desire to play Skate 2, which I skipped last weekend." Loren "AgtFox" Halek - "Playing NBA Live 10, Halo 3: ODST and maybe some other stuff."